My work intermingles the magical, the uncanny, the impossible, and the real. It ranges from painting, drawing and printmaking to construction, installation, and performance. At times I collaborate. While I depict the natural world, the results are constructed, taken from moments of direct observation, but recombined to embody a more existential reality. My installation, “The Storks Come Home to Roost” comes from images gleaned from a recent trip to Morocco. While there, I was struck by the pervasive presence of white storks. These impressive birds build their large, messy nests everywhere within the cities’ architectural structures. The nests are comprised of not only natural materials but also with the detritus of the city – plastic bags, pieces of fabric, or whatever else seemed appropriate for either structure or decoration. 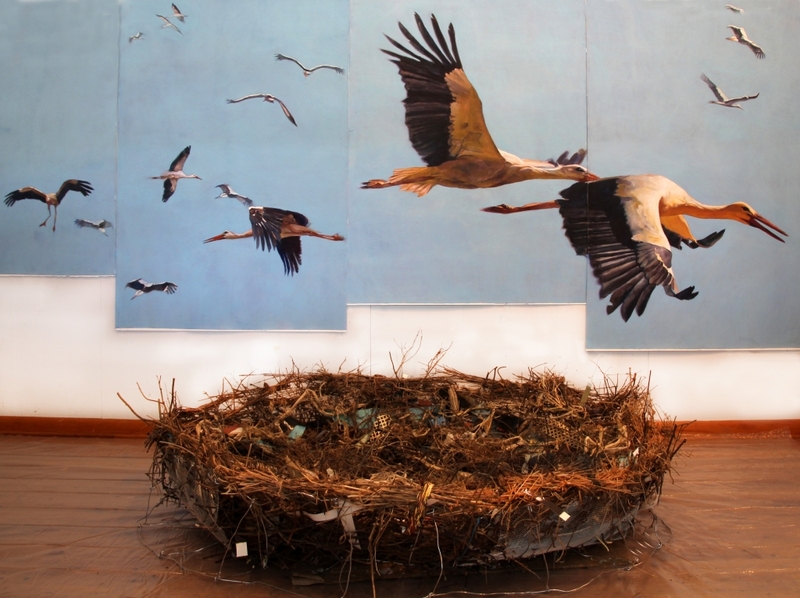 This installation features the storks with my nest, made of natural materials and the detritus from my studio. About the artist: Cheryl Agulnick Hochberg is a Pennsylvania-based painter. Her work has been exhibited throughout the US. Including solo exhibitions at the Radford University Art Museum (2017), the Allentown Art Museum (2015), the Salisbury University Art Galleries (2016), Montgomery College/Takoma Park (2013), The Banana Factory in Bethlehem, PA (2013), and Sweetbriar College (2012). Group shows of her work include Art Prize in (Grand Rapids, MI), the Ice Box and Gravers Lane Gallery (both n Philadelphia), and Womanmade Gallery in Chicago. Cheryl has participated as a fellow in many artist residency programs including UCross (Clearmont, WY), Jentel (Banner, WY), The Studios at Key West (Key West, FL), and the Virginia Center for the Creative Arts (Amherst, VA). She is a 2015 recipient of the Kutztown University Chambliss Award for Excellence in Faculty Scholarship. Hochberg is Chairperson of the Department of Art and Art History at Kutztown University.